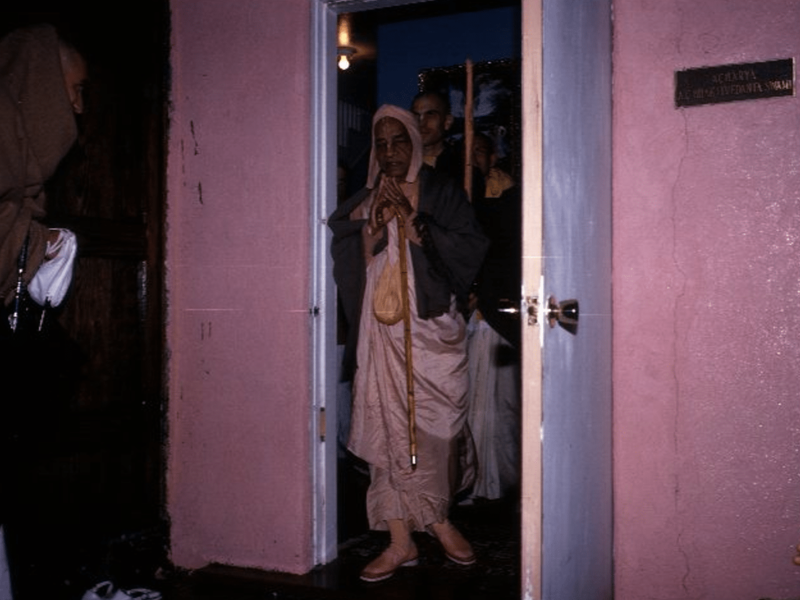 Bhaktivedanta swami had to deliver the medicine for the ills of Kali Yuga. He knew it was needed on a much larger scale than he could reach on his own. But even to administer one issue of back to Godhead was almost beyond his means writing the articles typing them taking them to the printer and distributing them should not have been the work of one lone impoverished devotee. At his room in the Chippiwadda temple he typed day and night as he sat beneath a small light that dangled from the ceiling. He sat on a thin mat on the floor with his typewriter before him on a trunk as pages accumulated. He kept them in place with stones food and sleep were only incidental. He was completely convinced that Srimad Bhagavatam would create a resolution in this misdirected civilization. He translated each word and wrote each purport with clarity and concentration. But it had to be done as quickly as possible the typewriter he used was a portable unit which looked like the first typing machine ever indented the carriage folded back when not in use and was really hard to make the keys work properly. He had to work with two fingers pressing down hard to make the impression on the paper. He used discarded paper taken from the Russian embassy which ironically had Russian impersonalists propaganda printed on the reverse side his room was situated just above the deities. So in middle of the room there was placed a small cement dome which covered the exact location of where the deities were situated below.